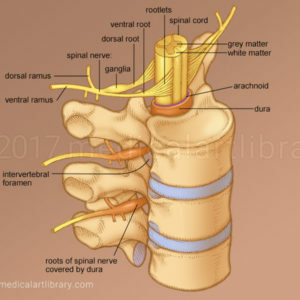 The intervertebral disc is made up of an outer ring called the anulus fibrosus, and an inner core of a soft gelatinous substance called the nucleus pulposus. The anulus fibrosus is composed of fibrous tissue and fibrocartilage laminae arranged in concentric rings. When a disc is injured or becomes less flexible with age, damage can occur which causes the disc to bulge or tear, and the gelatinous core may be extruded. This is called a herniated disc. 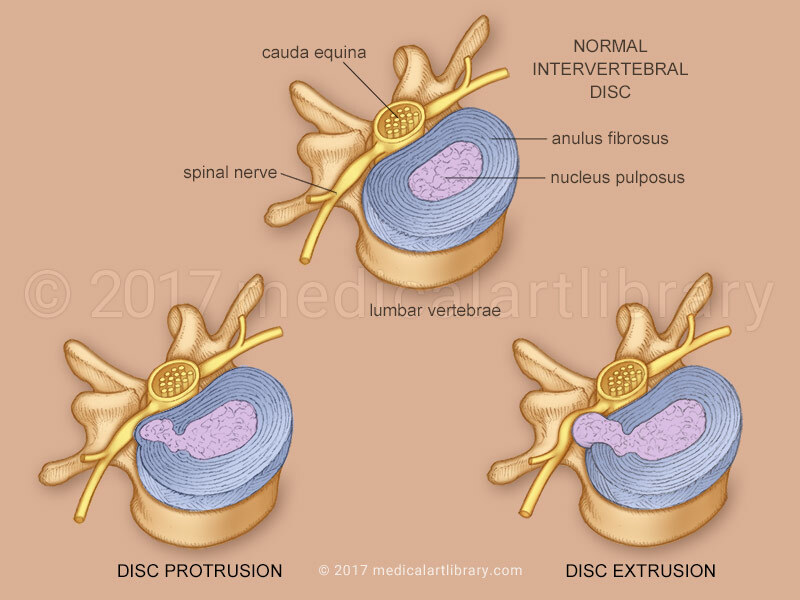 A disc protrusion occurs when the nucleus pulposus extends into the anulus fibrosus without actually rupturing through it. A disc extrusion occurs when the material of the nucleus pulposus ruptures through the outer anulus fibrosus. 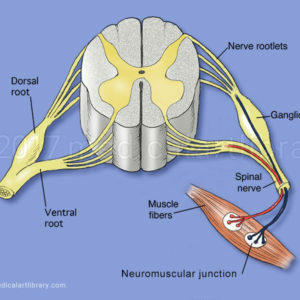 Herniation occurs most frequently in the lumbar area of the spine. The bulging disc or protruding core may press upon or impinge a spinal nerve, nerve root or the cord itself. This can cause weakness, numbness, or pain, which can radiate from the lower back down the leg. Sciatica can occur when there is compression to the sciatic nerve or to its (spinal nerve) roots by a buldging disc.